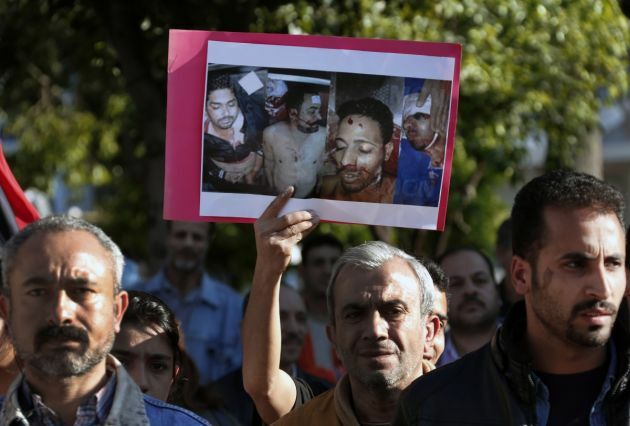 (REUTERS/Yannis Behrakis (GREECE - Tags: RELIGION CIVIL UNREST))Egyptian Coptic Christians hold pictures of other Coptic Christians killed recently during sectarian violence in Egypt, during a protest in Athens April 12, 2013. Hundreds of Egyptians living in Greece marched through Athens to protest against sectarian tension following days of fighting in Egypt killing eight - the worst sectarian strife since Islamist President Mohamed Mursi was elected in June - many Copts now question whether they have a future in Egypt. CAIRO (Reuters) - "Egypt is no longer my country," said the 24-year-old construction worker, standing in the courtyard of the country's largest cathedral where one Copt and one Muslim died in sectarian clashes this week. "The situation of Christians is worsening from day to day. I've given up hope that things will improve," he said. Christians, who make up a tenth of Egypt's 84 million people, have been worrying about the rise of militant Islamists since the fall of President Hosni Mubarak in 2011. But after days of fighting at the cathedral and a town outside Cairo killing eight - the worst sectarian strife since Islamist President Mohamed Mursi was elected in June - many Copts now question whether they have a future in Egypt. An angry young fringe of a community that has lived in Egypt since the earliest days of Christianity may also be turning to violence. "The attack on the cathedral was the crossing of a red line," said Michael Sanouel, a 23-year old technician in a steel plant. Sanouel rushed to the cathedral "to defend it" when he heard about the clashes that lasted more than five hours. "I have been looking for a while for a job abroad, in Italy or Germany," he said, standing next to a piece of charred wood from a tree hit by a petrol bomb hurled over the compound wall. "I have two children but I don't want them to grow up under a Muslim Brotherhood regime," said Sanouel, who slept in the cathedral compound like dozens of others after the clashes, ready to defend it if more confrontations erupted. The trouble flared after a funeral on Sunday of four Copts shot dead last week in the town of El Khusus, north of Cairo. President Mursi and his Muslim Brotherhood allies were quick to condemn the sectarian violence, the latest turmoil to hit a post-Mubarak Egypt beset by political and economic crisis. Mursi said the cathedral attack was like an attack on himself but in a rare rebuke, the Coptic Orthodox Pope, Tawadros II, said Christians were tired of promises. "The president assured us personally that he would do everything to protect the cathedral... but in reality this was not the case," Tawadros told a private TV station when he called in to a live talk show. "We have seen enough committees being formed. We want action, not words." Youssef Sidhom, editor of the Coptic newspaper al-Watani said the pope, elected in November, had chosen strong words because Christians inside the cathedral felt police had abandoned them by withdrawing when the clashes started. "There is an absence of the state and the rule of law and the violence at the cathedral proves that," he said. Police had not stopped attackers throwing petrol bombs and firing bird-shot from neighboring houses into the cathedral compound. Live TV footage showed an almost motionless police cordon while clashes raged for several hours. The interior ministry said Christians started the trouble by torching some cars after the funeral, angering neighbors, an account confirmed by a Reuters reporter at the scene. Copts have long complained of discrimination in the job market, before the law and in getting permits to build churches. Now they say they were better off under Mubarak, who used to jail Islamists, although 23 people died in a bomb attack on a church in Alexandria shortly before his overthrow. Many Copts believe Muslim radicals want to eradicate Christianity, whose roots in Egypt predate the Islamic era. Some Copts were dismayed that Mursi did not attend the installation of the new pope or Coptic Christmas ceremonies. Samir Morcos was the president's only Christian aide until he resigned in November when Mursi gave himself greater powers. "Some people want to destroy our state," Morcos told Reuters. "The situation has become very dangerous." Christians acknowledge that some of their grievances such as access to government jobs are shared by many Muslims struggling to make ends meet in a country rife with corruption and poverty. But some fear life for Copts will worsen as the Brotherhood extends its control to a growing number of state institutions. "We are in state of depression," said Father Metuas Nasr, a priest who said he had abandoned his church outside Cairo after repeated attacks from hardline Islamists. "The Brotherhood is now taking over all state institutions. We don't have a (neutral) police anymore as you could see at the clashes. There is no official data but church officials say many Copts have left the country since Mubarak's overthrow. "I know so many people who have left or plan to go," said Peter el-Naggar, a church activist and lawyer. Western diplomats said that while their countries do not record the religion of visa-seekers, anecdotal evidence suggests a high percentage of those who had left since 2011 are Copts. The most high-profile departure was billionaire Naguib Sawiris, who settled in Europe after infuriating Muslims by tweeting a cartoon of Mickey and Minnie Mouse in Islamic dress. Compounding their misfortunes, some wealthier Egyptian Copts traditionally deposited their savings across the Mediterranean in Cyprus for safe-keeping, a senior diplomat said. They may now face large losses since accounts with more than 100,000 euros in the island's two biggest banks will suffer a "haircut" to help pay for bailing the country out. The sectarian strife is a sharp contrast to the harmonious images of the anti-Mubarak revolt in Cairo's Tahrir Square, when Copts formed protective cordons around Muslims at prayer and Muslims brandished the Koran and the Bible. Many moderate and liberal Muslims attended the cathedral's funeral service and others were quick to come the next day after to show their solidarity and denounce Mursi and the Brotherhood. "The attack is unacceptable to me," said Ahmed Sharif, a Muslim. "For me, the Coptic Cathedral is a symbol of Egypt like al-Azhar," he said, referring to the highest Muslim authority. Sidhom, the Coptic editor, said that while some Christians might be planning to leave the vast majority would stay to confront the Brotherhood in upcoming parliamentary elections. "I am one of those who want to stay and fight back," he said. In last June's presidential poll, many Copts voted for Mubarak's last premier, Ahmed Shafiq, who came a close second. Many now hope moderate Muslims fed up with queues at fuel stations, power cuts and a rise in crime will turn against the Brotherhood at the polls, which could take place in October. But their hopes could be dashed if the weak and fragmented opposition fails to unite or sticks to threats of a boycott. "I feel frustrated (with the liberal opposition)," Sidhom said. "I hope that... they would wisely reconsider their position and take steps to participate in the elections." If the Muslim Brotherhood and more radical Salafist parties gain the upper hand, some church activists have few illusions that their youth will also become more radical. Some Copts are ready to resort to violence. A Reuters reporter saw two young men with guns and a crate of petrol bombs on the roof of the cathedral during the clashes. A day after the clashes, the mood was still tense at the cathedral compound which also houses a theological institute, a nuns' home and a tailor for religious vestments. Officials kept the doors closed - not just for protection but also to stop angry young Copts arriving as rumors of more violence swirled around. "We want to get in," shouted a group of young men, banging at the door. Some showed cross tattoos on their hands but a guard told them: "Nobody is allowed in today."